As the top messaging app in Japan, ‘Line‘ reaches approximately one third of the population. With the addition of a new children’s app, Line’s reach is about to get even bigger. Marketed toward kids age six and younger, the recently released Line Kids app is currently available only in Japan. The developers of Line and Line Kids say that they do not have any plans to release the new app outside of the country, however, the size and scale of Line and its components make it a potential key player in the messaging industry around the world. Line messenger is very popular in other parts of the world (its actually the most downloaded app in over 40 countries) and it is very possible that developers would take advantage of the same opportunity with Line Kids in the future. Fingers crossed! Line Kids is a free download just like its mother app, Line, and it boasts several educational features such as picture books and songs for children to use alone or to use with their parents. 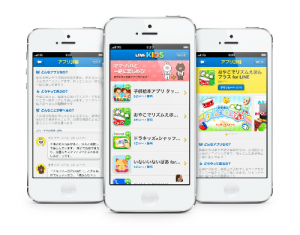 Unlike many free apps, Line Kids is completely ad-free, however, parents are able to make additional in-app purchases. The release of Line Kids is the second announcement to come from Line about a new app release this month, as they expand their products and attempt to draw in new users. On December 18th Line released a new app called Line Cafe. Essentially, Line Cafe is a chat room app where users who have the same interests (cooking, soccer, child-care) can meet up and open private invitation-only cafes as well. The popularity of Line’s products is undeniable and we can only hope that Line Kids will follow behind the original Line app and be available all over the world very soon! The original Line app can be downloaded for free via the iTunes Apple app store and is available for both iPhone/iTouch and iPad.